Behaviour analysts are being recruited at a Welsh prison to deal with some of the violence and self-harm problems. 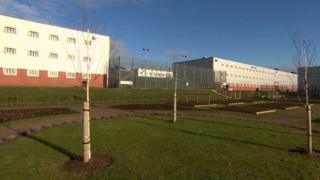 Ten men accounted for more than half of self-harm incidents at Parc prison in Bridgend. "The influx of psychoactive substances... has had a very negative effect on self-harm and violence," Janet Wallsgrove, G4S director at HMP Parc told MPs. It had the highest rate in Wales last year, according to research. Ms Wallsgrove, giving evidence to a Welsh Affairs Select Committee hearing on Welsh prisons, said improved staff training had been brought in, as well as a greater focus on the early days in custody when prisoners were particularly vulnerable. She said that reasons for self-harm were many and varied. "There are significant mental health issues, with a number waiting for placements to secure units; personality disorder; family issues; or drug and alcohol issues," she said. "[The prisoners are] not under mental health services; they're falling through pathways, really." Ms Wallsgrove said comparing levels of violence at prisons across England and Wales was difficult. "At Parc one of the reasons levels of violence are so high is because we have young people - 15-18 year olds; we have quite a lot of young offenders - 18-21 year olds - and quite a large percentage of young adults. Evidence shows the younger the people in custody, the more likely they are to self-harm."